We define argumentation as the process of proposing, supporting, critiquing, and refining ideas. Argumentation is scientific in nature when people attempt to support or critique an idea based on criteria that are valued within the scientific community. Scientists rely on different types of criteria to determine if a claim is valid or acceptable but one of the most important is how well a claim fits with the available evidence. Scientists, as a result, tend to be skeptical of claims that are not supported by any evidence at all and will reject or modify claims that do not fit well with the evidence that is available. Scientists will therefore argue from evidence when they attempt to support or challenge a claim. Scientists must also convince others that the evidence they are using to support or challenge a claim is valid or acceptable. Scientists, as a result, spend a great deal of time assessing, critiquing, and defending the evidence that they use to either support or challenge claim. Why is Scientific Argumentation Important? Scientific argumentation is important because a new idea must be shared, evaluated, and refined by the scientific community before it can become a part of the body of knowledge that scientists use to help explain how the work works. Scientists, as a result, rarely work in isolation. Scientists spend a great deal of time emailing colleagues to ask for feedback or advice, sharing and critiquing ideas with other scientists over coffee or a meal, refining ideas during a research group meeting, or working with colleagues to prepare conference presentations and journal articles. They also provide formal reviews of other scientist’s proposals, presentations and journal articles. This review process is important because it helps to ensure that a new idea is not based on flawed reasoning and the evidence used to support a new idea is valid. Scientific argumentation also helps scientists improve their arguments. What is the Nature of Arguments in Science? The framework at right is designed to help students understand the nature of a scientific argument. In this framework, an argument consists of a claim, evidence, and a justification of the evidence. The claim is a conjecture, conclusion, explanation, principle, model, or an answer to a research question. The evidence component refers to data or findings from other studies that have been analyzed and then interpreted by the researchers in a manner that allows for an appraisal of the claim. It is important to stress that in this framework, data and evidence are terms that have different meanings. Scientists collect data during their investigation or gather findings from other studies by conducting a review of the available literature. Scientists then transform the data or the findings they have collected into evidence. In order to transform data or findings into evidence, scientists first analyze the data (e.g., by making comparisons between groups, looking for trends over time, identifying relationships between variables, or synthesizing the available literature) and then they provide an interpretation of their analysis. The final component of the framework is a justification of the evidence. The justification of the evidence explains why the evidence matters and why it is important enough to include in the argument. Scientists often use a specific principle or concept to help explain why the evidence is important. They also discuss the assumptions underlying their analysis of the data (or findings) and their interpretation of the their analysis. How do Scientists Evaluate Arguments in Science? Scientists tend to use several different types of criteria to evaluate the merits of a scientific argument. These standards for quality can be classified into empirical and theoretical criteria. Empirical criteria include (a) the claim is consistent with the available evidence, (b) the evidence is relevant, (c) the method used to collect the data was appropriate and rigorous, (d) the method used to analyze the data was appropriate and sound, and (e) the amount of evidence included in the argument is sufficient. Theoretical criteria, in contrast, refer to standards that are important in science but are not empirical in nature. 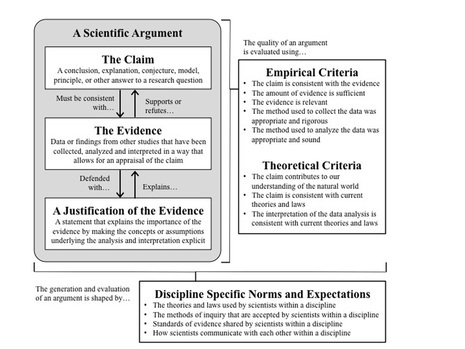 Examples of theoretical criteria include (a) the claim contributes to our understanding of the natural world, (b) the claim is consistent with current theories and laws, (c) the interpretation of the data analysis is consistent with current theories and laws, and (d) the evidence used is important given current theories and laws. What counts as quality within these different categories, however, varies from discipline to discipline (e.g., physics, biology, geology) and within the fields that are found with a discipline (e.g., cell biology, evolutionary biology, genetics) due to differences in the types of phenomena investigated, what counts as an accepted mode of inquiry (e.g., experimentation vs. fieldwork), and the theory-laden nature of scientific inquiry. It is therefore important to keep in mind that the nature of scientific arguments and what counts as quality in science is discipline and field dependent.